Our branch of the Green family originated in Milton near Gravesend in Kent where John Green I was baptised in 1697. He became a wheelwright and first appears paying rates in East Malling in 1727. It is probably him who married Mary Hollands of Maidstone at Aylesford in January 1728. They subsequently had several children all of whose baptisms appear in the East Malling parish registers. He died in August 1779 aged 82. In his will he left his eldest surviving son John all his working tools and timber and stock in trade at his shops at West Malling and East Malling provided that he paid his brothers, James and George, five pounds after his decease. His son, John Green II, was baptised in December 1730 and he married Jane Jones at East Malling in February 1764, and it appears likely that he was also a Wheelwright. Their sons were all baptised at East Malling. Samuel (who later plays a big part in the family history) in May 1769, John III in September 1771 and William in September 1781. William was also received into the congregation of the Earl Street Chapel at Maidstone. For three years prior to his death in 1791 the family appears receiving poor relief. Both he and his wife Jane died in April that year and no will has been found. We do not know where the boys went to school; however Samuel became a carpenter, builder and surveyor and lived in Sevenoaks. John III [who we will now refer to as John Green snr) became a papermaker and worked for William Turner at Chafford Mill at Fordcombe near Tunbridge Wells. In 1800 he married William’s sister Ann and they had seven children, Henry 1801, John 1803, Ann 1806, Emily Jane 1808, Charles William 1811, Louisa 1812 and Elizabeth 1814. John Green Snr continued to work at Chafford but was leasing Otham Mill near Maidstone by 1811 and Hayle Mill by 1814, when his daughter Elizabeth was baptised at Earl Street Chapel in nearby Maidstone. In 1817 he purchased Hayle Mill from John Pine and the family moved into the Mill House. Henry became the Unitarian Minister at Brook Street Chapel, Knutsford, Cheshire, and it was his daughter, Isabella, who married Arthur Jamison. More details of this family and their letters can be found in the Greens of Cheshire section. When they were old enough John jnr and Charles entered the business and they continued trading both there, and at Otham Mill until 1838, when they went bankrupt. John senior’s elder brother Samuel, having already put money into the business, agreed to purchase the Mill so they avoided bankruptcy. He kept his brother, John, as manager, but on the proviso that his son John Barcham Green would be trained to take over the business – which he did in 1852. In her reminiscences written in about 1930, Isabella Jamison wrote the following regarding the fall of her grandfather’s business: “I have understood that the cause of his business not doing well was caused by his second son [John] believing that he was discovering better ways of paper making and he stopped the work on the profitable old ways to try out his experiments. I was told by my cousin Henry Powell (the eldest son of Henry and Emily Jane nee Green) that many of the new ideas were clever and promising but the fault lay in interrupting the regular work. There may also have been other reasons that contributed to the failure. The winter weather in 1836/37 was harsh and in 1838 there were severe and protracted frosts, and these conditions may well have caused problems with paper production. Ann married Benjamin Mardon in 1828. At the time he was the Minister of Earl Street Presbyterian Chapel in Maidstone, but they married in Loose Parish Church. They had no children and in 1854 they moved to Sidmouth where Benjamin became the minister of the Old Dissenting Meeting House. After his death in 1866 she lived with her widowed sister Emily Powell, first in Tunbridge Wells and then at Maidstone until she died in 1889 and is buried at the Sutton Road Cemetery. Louisa never married and after her father and brothers went bankrupt she set up a school for girls which she ran with her sister Elizabeth in Maidstone. By 1861 they had both retired and aged 46, Elizabeth married Charles Ellis, a widower from Maidstone, and long standing friend of the family. They were married by Benjamin Mardon at Sidmouth but returned to live at Rocky Hill Terrace in Maidstone with Louisa. After Charles Ellis died the two sisters left Kent and went to live in South Norwood. Moving by 1881 to live with their niece Catherine and her father, their brother, Charles William in Teignmouth, Devon. Catherine had lived with her aunts since childhood and attended their school from an early age. After Charles died the three ladies moved to Lustleigh, near Newton Abbot. Catherine died in 1891 in London, Elizabeth at Lustleigh in 1901 and Louisa at Plymouth in 1902. Elizabeth, Louisa and Charles are all buried at the Old Cemetery at Teignmouth. After the failure of the business John jnr. and Charles William left Kent. John and his family moved to Weston-Super-Mare in Somerset and he started acting as a paper agent, and there is much correspondence and orders from him within the Hayle Mill Archive. He later founded the business of John Green & Son in London, with his son Frank. This in turn became Frank Green & Co. Frank Green became Lord Mayor of London in 1900. John Green jnr died in 1880 and is buried at Bessels Green Chapel in Sevenoaks. Frank Green died in 1902. Charles William was then to lead a rather chequered career and more about this can be seen under family history/Green/ Charles William Green. 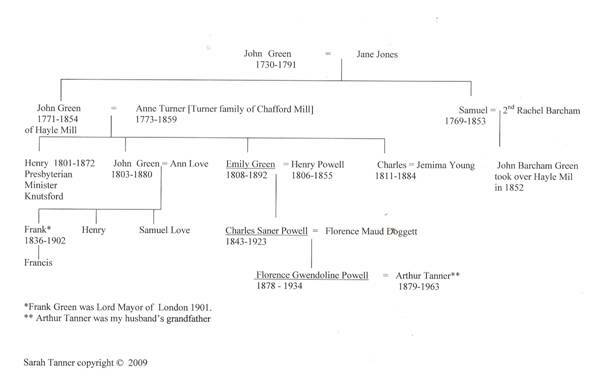 The Tanner connection to the Green family was through Emily Jane Green who married Henry Powell, a doctor in Whitechapel, in 1836, and they had seven children. Sadly Henry died of pneumonia in 1855 aged only 48. Their son Charles Saner Powell, born 1843, married Florence Maud Doggett in 1877. Their daughter, Dorothy, married Arthur Tanner, my husband’s grandfather, in 1904. Emily died in Maidstone in 1892 and is buried at the Sutton Road Cemetery in the same grave as her sister Ann Mardon and daughter Emily. The last two letters written in 1901 came into my possession in 2009 from Chris Dimont. Frank Green was his great-grandfather. His youngest daughter Nora was his paternal grandmother and Nora married his grandfather Charles Dimont, the orphaned son of a clergyman. His grandpa later became Chancellor of Salisbury Cathedral. He died in 1953. What was amazing for me was that the two letters substantiated much of the research I had carried out over the years into the Green and Turner families. Chris also produced a copy of the marriage certificate of John Green and Ann Turner, the original of which no longer survived having been destroyed by enemy action in WWII. Reading the letters it was apparent that the families did still keep in touch, and the enquiries by Frank Green to his sister Mary at the time he became Lord Mayor of London was presumably as he had to produce proof of evidence of his descent.